UPDATE: 19 NOVEMBER 2015. Great News!! Global Geoparks are now official UNESCO sites. Most of you have no idea what a Global Geopark is. That’s not surprising, because – according to my WordPress statistics – most of you are located in Canada and the United States and there are only two (2!) Global Geoparks in these two countries, both of them in Canada: Stonehammer Geopark in the Saint John (New Brunswick) area (enlisted in 2009) and – as of this week! – Tumbler Ridge Geopark in British Columbia. I wrote about Stonehammer in an earlier post as well and I have just added Tumbler Ridge to that post. There are about 115 Global Geoparks in the world, most of them in Europe and the Far East (predominantly in China and Japan). There isn’t a single Global Geopark in Africa, Australia, New Zealand or the Pacific and there are only two in all of South America. If that seems lopsided, it probably is, but it does explain why most people in North America are clueless about them. Let’s first explain what it is not: a Geopark is not a Park in the traditional (North American) definition of the word, i.e. a well defined area set aside for whatever recreational or conservation purposes under the authority of a government body. Then what on earth is it? Historic sites where cultural events were tied to an area’s geologic features, such as those in the history of geology, mining and geology in early exploration and settlement. The overall goal of a Geopark is to integrate the preservation of significant examples of geological heritage within a strategy for regional sustainable socio-economic and cultural development, while safeguarding the environment”. Right – you can’t just declare an area a geopark, there has to be a strategy for development and that strategy has to be environmentally-friendly and sustainable. So the challenge is to integrate geologic heritage with regional economic development and ‘greenness’. Geologic heritage is just about everywhere around us, but most citizens are only minimally aware of that heritage and that is precisely the point of a Geopark: raise awareness of geoheritage with local citizens (K-12 and beyond) as well as visitors. Protect the environment, while providing incentives for local business, especially tourism-related business. So a Geopark is not a fenced-off hands-off area. On the contrary: it’s a no-fence hands-on area where local business operators cooperate to promote geoheritage through a series of fun and educational activities for all ages. This cooperative effort is independently managed by a board, composed of citizens representative of that Geopark community. You might argue: that’s an interesting idea, but why do we need this whole new category called Geoparks? Aren’t there enough regular opportunities to celebrate geoheritage? Good point – there are lots of opportunities to celebrate geoheritage and we’re reasonably good at it in Canada (see my earlier post on the Canadian geoheritage surge here). But what makes Geoparks special is that this has become a global movement. The thought behind the original idea (launched ca. 20 years ago by an earth scientist-staffer at UNESCO headquarters in Paris) was that the world has lots of valuable Geoheritage that doesn’t qualify as UNESCO World Heritage and that most of that Geoheritage tends to get ignored by the world’s various park organizations, which overwhelmingly focus on living nature and archaeology without paying too much attention to the deep-time-origin of much of that living nature. the manner in which our planet bubbles and moves and puts vulnerable citizens at risk. National boundaries are irrelevant for understanding Geoheritage: hence a global movement. And did the idea ever take off. Twenty years after that original idea, UNESCO is seriously looking into making Global Geoparks an official UNESCO program, which would give it a status like that of World Heritage. Currently, the Global Geopark movement is a Network of Member Geoparks, the GGN. As the members emphasize: “it’s not just a list, it’s a network”. Member representatives get together in even years for a Global Geopark Conference and they gather for a regional Geopark Conference in Europe and Asia in odd years. The first time a Global Geopark Conference was held in North America was last week, in Saint John (New Brunswick), the hub of Canada’s first Geopark: Stonehammer. And I got to go! And while I knew quite a bit about Geoparks and the Global Geopark Network before I went, I had not anticipated the sheer force of passion that I would meet. This truly is a movement: here are thousands of people worldwide (there were nearly 500 at the Conference) who have found each other in the passion of promoting geoheritage as part of local or regional economic development and they are doing that under a globally recognized umbrella, the Global Geoparks Network. The people that attend this conference aren’t only representatives of Global Geoparks – there are also representatives of Aspiring Geoparks, some of which are close to being to submit an application, for others it’s still a far-away dream. There were also representatives of UNESCO World Heritage sites, national and regional parks, etc. It’s impossible to give you an exhaustive review of the conference (which was very well organized by the Saint John Stonehammer-folks), so here are some highlights, which I hope will illustrate what this movement is…. well… moving to. First of all, there was the opening address by the Canadian Ambassador to UNESCO, Jean-Pierre Blackburn, who praised the Global Geoparks Network for carrying out a mission that is in line with the goals and objectives of UNESCO. His entire speech is here: Address Ambassador Blackburn Geoparks Conf (worth reading!). I was impressed by the creativity of the English Riviera Geopark. 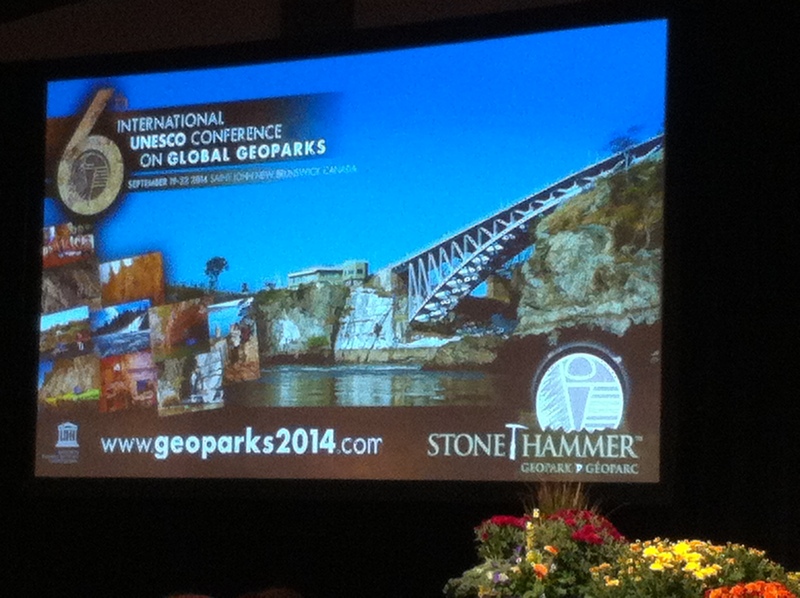 They were established as a Global Geopark in 2007 and will host the next convention in 2016. This Geopark contains the area of Torbay between the cities of Torquay and Brixham in county Devon in South England. There are no fewer than 32 geosites within this Geopark! Interestingly, one of this Geopark’s initiators is Nick Powe, the proprietor and operator of Kent’s Cavern. So yes, Kent’s Cavern is privately run and Nick is the 5th generation (!) of the same family running this business! If that wasn’t special enough: Kent’s Cavern hosts England’s oldest human remains, dating back to the Neanderthals. The cave system has been subject to intense research for close to two centuries, but you can also host a birthday party or a wedding there. Left: Nick Powe of Kent’s Cavern, one of the sites of the English Riviera Geopark. Right: English Riviera Geopark delegates – they also made music! I listened to a passionate talk by Farah Alam, who just completed her MSc in landscape architecture at Ball State University in Indiana (her thesis is here). She is from Hyderabad, and works with the Society to Save Rocks, a Hyderabad-based organization that aims to preserve and protect the spectacular 2.5 billion year old granite formations of the Deccan Plateau. The city of Hyderabad is booming and its glorious Monadnocks are blasted to bits to make way for the city. Farah explored whether establishing a Geopark could help the city grow in a sustainable manner without destroying what is essentially an important part of its cultural identity. She designed an inspiring and innovative interpretation centre and landscaping as part of her thesis requirements. 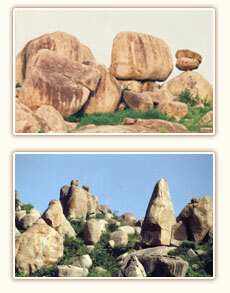 The granite landscape near Hyderabad. The conference took place in the well-designed Saint John Trade and Convention Center, which also houses the city’s public library and the New Brunswick Museum. Its geology curator, Dr. Randy Miller, was one of the main drivers behind the Stonehammer Geopark. Adding to the spirit of the week’s most important event in Saint John was an international stone sculpting symposium that took place on the dock side in front of the convention centre. 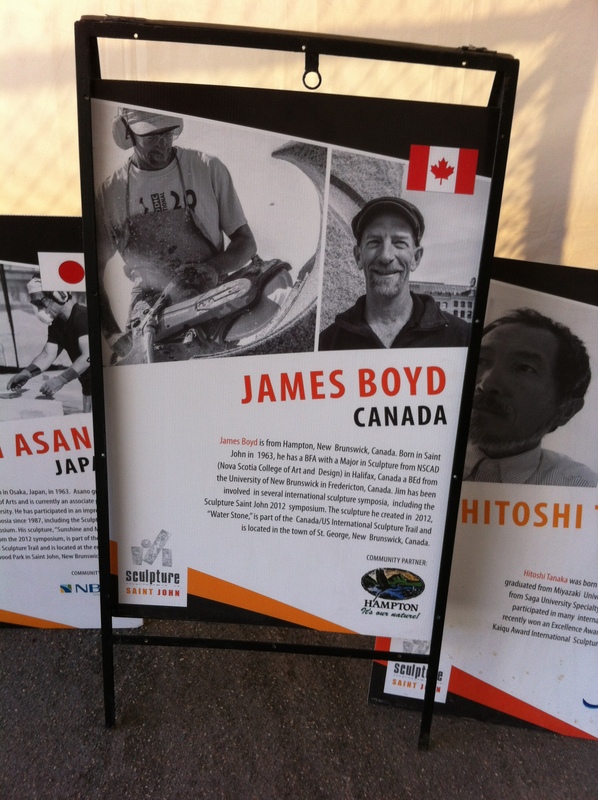 Left: The bio of James Boyd, New Brunswick stone sculptor. Right: the work he created during the week of the Geoparks Convention. I was immensely inspired by everything I saw and heard: the Global Geopark concept is an innovative tool for preserving geoheritage in a societal context. This is one of the better ideas ever. I predict that, 20 years from now, we’ll wonder how we ever did without this. This entry was posted in General geoscience, Geoheritage and tagged Canada, earth science, environment, geology, geoscience, Global Geoparks Network, natural hazard, outreach, public education, science outreach, UNESCO. Bookmark the permalink.